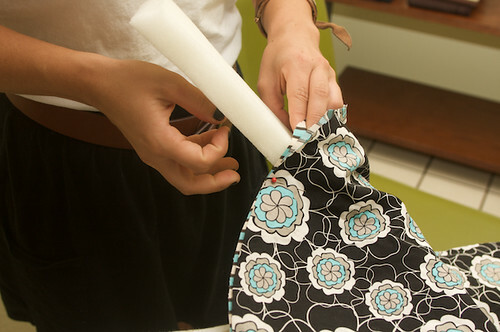 Reversible Pocket Sling Tutorial (with padding) « think liz. « A glimpse into our days. . .
Alright, the time has finally come for me to share this tutorial. I really feel that this sling has made it so much easier for me to calm Jude and just easier to keep myself sane! A new mama needs both her hands from time to time! The nice thing about this method of sling making is that you will have enough materials to make two slings. 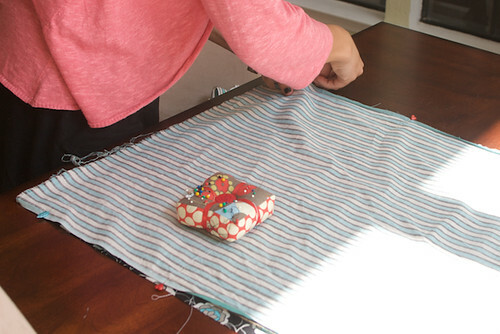 This tutorial only covers making one sling. Make sure to pre-wash all of your fabric in baby friendly detergent and then iron everything so it lays nice and straight! 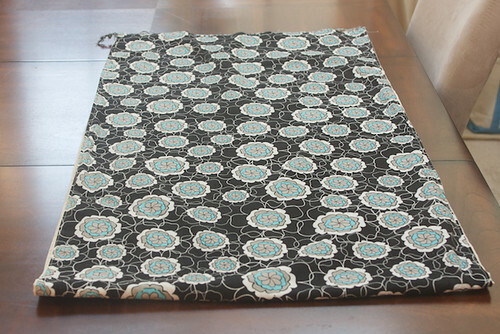 Also, you want 100% cotton fabric – nothing stretchy – you don’t want the sling to stretch out of shape. This could be dangerous. 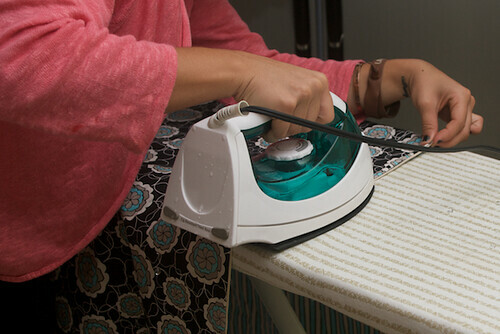 Fold exterior fabric in half lengthwise and iron a crease. Cut down the middle of this crease. 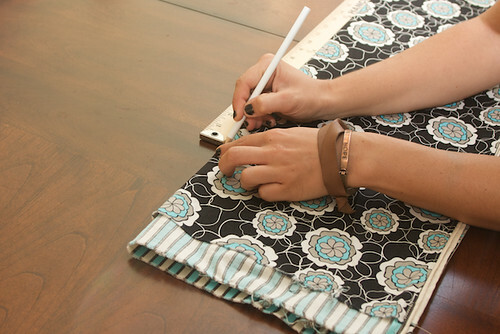 You will end up with two pieces of fabric that are 2 yards by approximately 22.5″ (depending on the width of your initial yardage). You will only use one piece to make the sling. 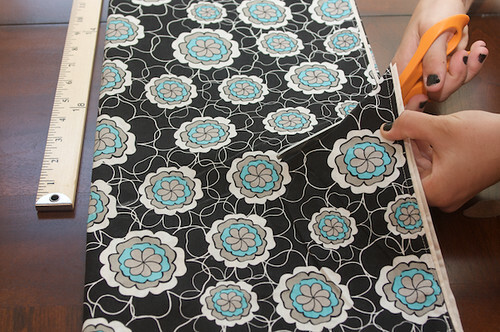 Repeat on interior fabric. Again, you will only need one of the two pieces. 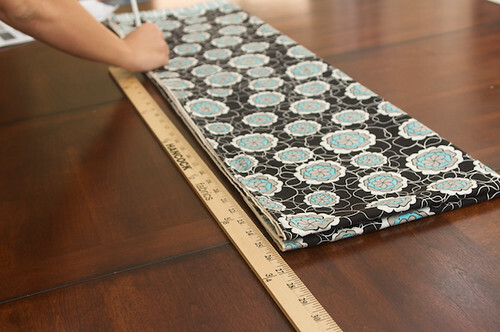 Cut 1″ thick upholstery foam into two 2″ x 9″ rectangles. This is your padding. For newborns, it pads their head from bonking on door frames and such. As they get older, it can be flipped to be worn on the bottom, padding their dangling legs! Right sides together, line up the edges and pin. 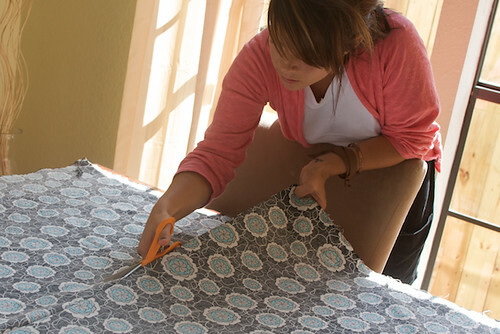 Now is a good time to trim off any excess if the fabric doesn’t line up properly. 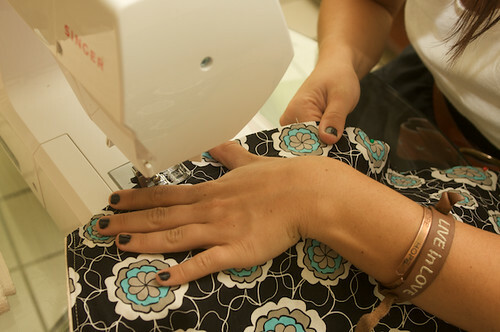 Back-stitching at each end, sew the long sides with a 1/2″ seam allowance. 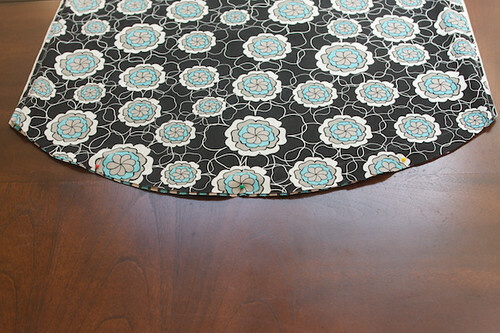 Turn fabric so that the right sides are facing out and iron flat. 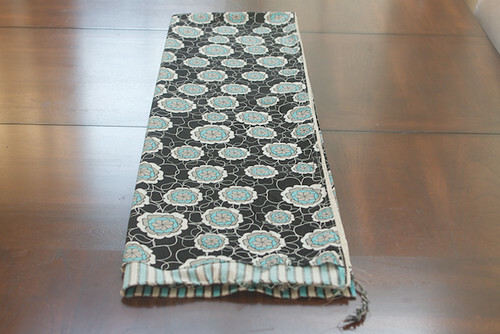 Top stitch up each long side with a 1/4″ seam allowance, back-stitching at each end. The best way to determine sizing is to take a piece of string and wrap it from your shoulder to your opposite hip and back to your shoulder. It will form a loop around your body, mimicking how the sling will lay. Don’t do this too tight though! Cut the string so that it hits the top of your mid-hip; you don’t want the sling to hit below your hip and you don’t want to be too far above your hip. Match your length to the chart below to get your correct size. Round up if you fall between sizes. and then again length wise. This is going to make the pocket for the baby’s bottom to sit in. Use a ruler to draw a straight line with a fabric marker between these points. Freehand a gentle curve between the points referencing the straight line as needed. Cut the curve out through all layers. The remnants are great to make matching burp clothes or bibs! Insert padding inside sling, one on each open side. Eventually the padding will lay against the straight seam, but for now, it’s just going to float freely until we sew the sling shut. 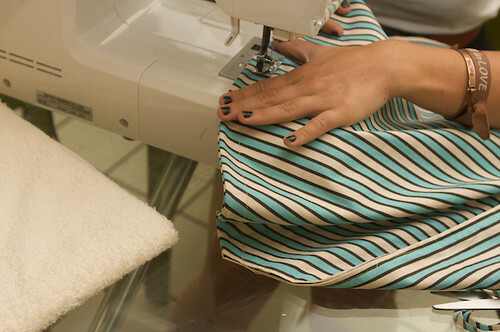 Make sure it’s far enough back that it won’t get in the way of your stitching. Fold in half longways and match up the curves. Pin in place. 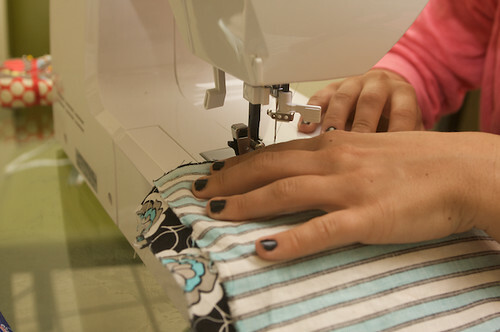 Sew a 1/4″ seam along the curve, back-stitching at each end, shutting the tube of fabric. 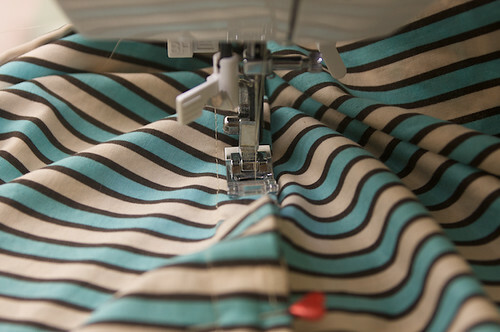 Flip the fabric the other way and iron the curve so the seam you just sewed is on the inside. We’re going to encase this seam. 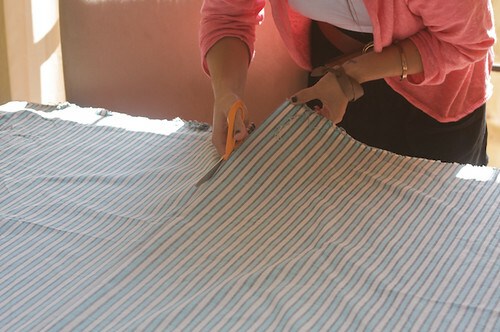 Following the curve, sew a 1/2″ seam around the curve, back-stitching at each end, encasing the raw edge of the seam inside. It will look a little weird because it will be sticking out (at this point, it’s called a French seam). No worries, the next step sews the edge that’s sticking up, down. 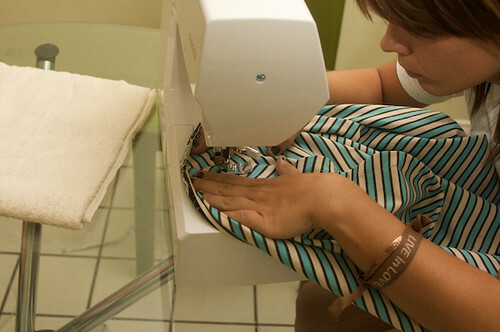 Lay the flap of fabric down and sew 1/4″ from the edge, back-stitching at each end, laying the seam down. You might want to pin starting from the middle to help minimize any bunching. This is a sturdy seam and it needs to be! It’s holding the weight of the baby! 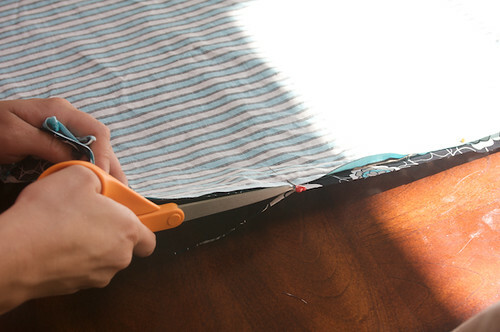 Maneuver the padding so that there is a piece on either side of the flat felled seam. 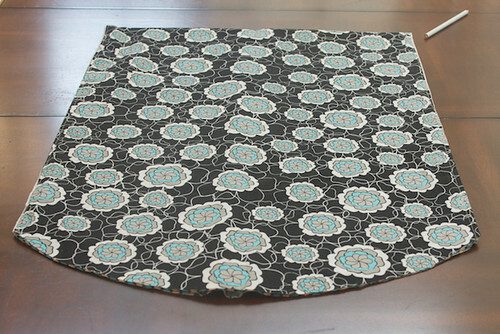 It should be as close to the top stitching and flat felled seam as you can get it. Pin in place. 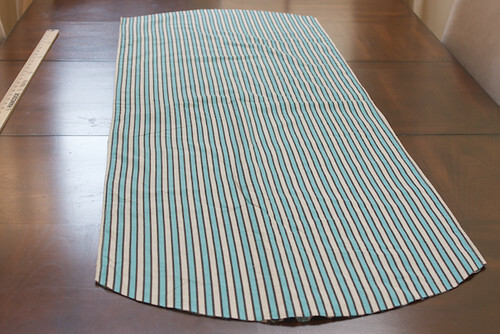 Starting from the flat felled seam, sew around the padding, back-stitching at each end, to keep it from moving around. Repeat on the other piece of padding on the other side of the flat felled seam. One thing I’ve thought of several times but never followed through on, is that you could add a zippered pocket if you choose not to make the sling reversible. Could be nice to have a place to hold keys, a cell phone or a pacifier! You’re all done! Click here for a pdf on how to use your new sling! 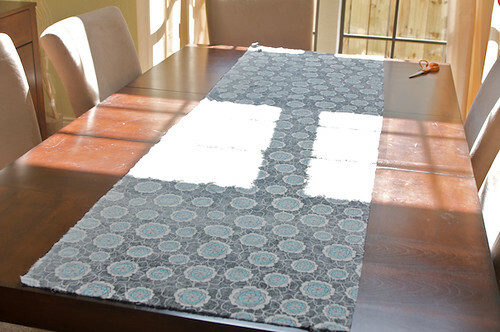 This entry was written by Elizabeth, posted on September 4, 2009 at 8:00 am, filed under Crafts, Free Pattern, Sewing. Bookmark the permalink. Follow any comments here with the RSS feed for this post. Post a comment or leave a trackback: Trackback URL. Look at you and you’re fabulous tutorial! Great tutorial, Elizabeth. I’m going to try to make my sister in law one in the next month or two, and I’ll post it on my blog. Yay, I’m so glad you put up this tutorial! 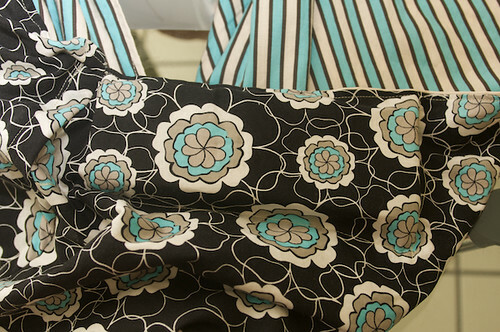 Once I use up some of the fabric I currently have, I’m going to buy some 2-yard pieces and make some slings for friends! Very cool. Thanks for sharing this tutorial. Great project and a great tutorial!! Everyone I know who’s having a baby these days is asking for one of these. Thanks Anne! 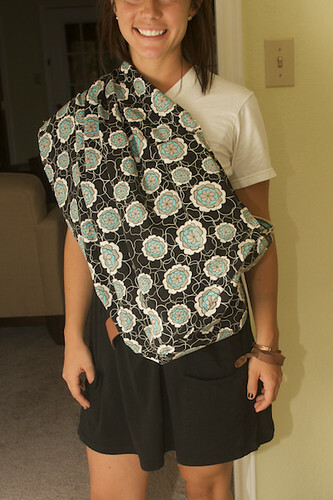 I’m glad to share the tutorial, the sling has certainly helped keep me sane with a new baby! I only hope to help out other new moms stay sane as well! I have been looking for the right baby sling to make for the endless number of friends and family who are having babies. They look like a lot of fun to make and wear with a little one. I really like your pattern and tutorial out of the many patterns I’ve looked at. There is one part I’m a little uncertain about and hope you can clarify for me. When you measure the body, you measure from shoulder to opposite hip. Where does the 52-68 inches come from? I measured myself and came to a 25 inch measurement so is that the number I should be following; the second table? 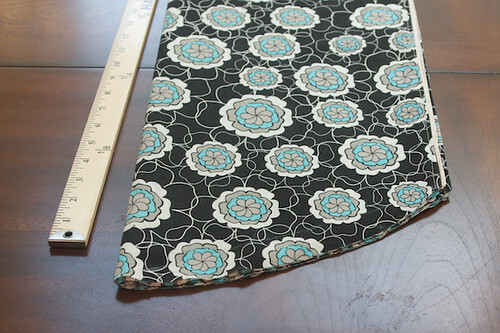 Also, another site suggested adding 5 inches for the sewn edges. Do you recommend doing this as well or stick with the measured number? I’m looking forward to trying your pattern. Hmm I guess I should clarify – you wrap the string all the way around, forming a loop, much like the sling will lay on your body. Basically, how tight you make the string is about how tight the sling will lay. The numbers I give in the table should allow for any seam allowances. I’m not sure why you would want to add 5 inches to the sew edges. . .
Good luck on the pattern and let me know how it works for you! I’d love to make any improvements to the tutorial that I can! Thanks! That makes sense. I’ll let you know how it turns out! I really like your tutorial, but when i made the sling (even though i thought i was gauging up) it came out to small. I have made other pouch slings and wanted to try your version since it was different. 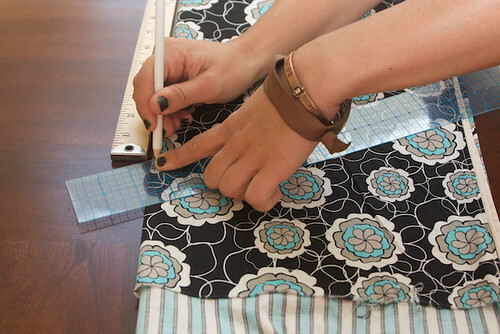 I love your method, but seam allowance should be included. I added the measurements you have for long and short ends and the long mark it exactly the measurement for the loop. But honestly i do like your method a lot!!! Hmm, that’s interesting – I’ve never had it come up short (seam allowances should be included . . . and there is only a 3/4″ of seams in the sling which is why I say not to measure too tight with the string when determining your size). I’m going to be making another one again soon and I’ll check the numbers to make sure they are still accurate. Thanks for letting me know! Hi Elizabeth! I love your blog! My son is about a couple weeks younger than your baby, does this sling still help you out? I need an faster way than the snugli I have from my first baby. If it does, I can’t wait to make it! I still use the sling daily! Mostly I use it to grocery shop or put him to sleep! THANK YOU for this tutorial! A friend of mine asked me to make her two slings- her and her friend both have Maltese poodles, and we have about 7 feet of snow right now… and their dogs can’t walk through it! LOL… so I made them slings with this tutorial, only took me about an hour to do 2 of them… super fast, easy, great tutorial. 😀 THANKS AGAIN!! I have looked at directions on about 80 sites now. These are absolutely the BEST! Thanks so much for taking the time to do it right.